The number of post-Mendelssohnian Jews who abandoned their ancestral faith is very large. According to Heman in Herzog-Hauck, "Real-Encyc." (x. 114), the number of converts during the nineteenth century exceeded 100,000; Salmon, in his "Handbuch der Mission" (1893, p. 48), claims 130,000; others ("Divre Emeth," 1880, p. 47; 1883, p. 187) claim as many as 250,000. For Russia alone 40,000 are claimed as having been converted from 1836 to 1875 ("Missionsblatt des Rheinisch-Westphälischen Vereins für Israel," 1878, p. 122); while for England, up to 1875, the estimate is 50,000 (De Le Roi,"Die Evangelische Christenheit und die Juden," iii. 60). Modern conversions mainly occurred en masse and at critical periods. In England there was a large secession when the chief Sephardic families, the Bernals, Furtados, Ricardos, Disraelis, Ximenes, Lopez's, Uzziellis, and others, joined the Church (see Picciotto, "Sketches of Anglo-Jewish History"). Germany had three of these periods. The Mendelssohnian era was marked by numerous conversions. 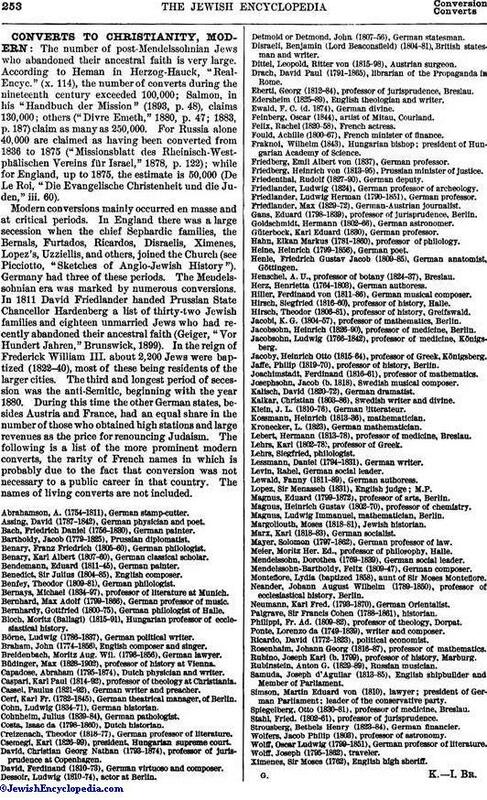 In 1811 David Friedlander handed Prussian State Chancellor Hardenberg a list of thirty-two Jewish families and eighteen unmarried Jews who had recently abandoned their ancestral faith (Geiger, "Vor Hundert Jahren," Brunswick, 1899). In the reign of Frederick William III. about 2,200 Jews were baptized (1822-40), most of these being residents of the larger cities. The third and longest period of secession was the anti-Semitic, beginning with the year 1880. During this time the other German states, besides Austria and France, had an equal share in the number of those who obtained high stations and large revenues as the price for renouncing Judaism. The following is a list of the more prominent modern converts, the rarity of French names in which is probably due to the fact that conversion was not necessary to a public career in that country. The names of living converts are not included. Abrahamson, A. (1754-1811), German stamp-cutter. Assing, David (1787-1842), German physician and poet. Bach, Friedrich Daniel (1756-1830), German painter. Bartholdy, Jacob (1779-1825), Prussian diplomatist. Benary, Franz Friedrich (1805-60), German philologist. Benary, Karl Albert (1807-60), German classical scholar. Bendemann, Eduard (1811-45), German painter. Benedict, Sir Julius (1804-85), English composer. Benfey, Theodor (1809-81), German philologist. Bernays, Michael (1834-97), professor of literature at Munich. Bernhard, Max Adolf (1799-1866), German professor of music. Bernhardy, Gottfried (1800-75), German philologist of Halle. Bloch, Moritz (Ballagi) (1815-91), Hungarian professor of ecclesiastical history. Börne, Ludwig (1786-1837), German political writer. Braham, John (1774-1856), English composer and singer. Breidenbach, Moritz Aug. Wil. (1796-1856), German lawyer. Büdinger, Max (1828-1902), professor of history at Vienna. Capadose, Abraham (1795-1874), Dutch physician and writer. Caspari, Karl Paul (1814-92), professor of theology at Christiania. Cassel, Paulus (1821-92), German writer and preacher. Cerf, Karl Fr. (1782-1845), German theatrical manager, of Berlin. Cohn, Ludwig (1834-71), German historian. Cohnheim, Julius (1839-84), German pathologist. Costa, Isaac da (1798-1860), Dutch historian. Creizenach, Theodor (1818-77), German professor of literature. Csemegi, Karl (1826-99), president, Hungarian supreme court. David, Christian Georg Nathan (1793-1874), professor of jurisprudence at Copenhagen. David, Ferdinand (1810-73), German virtuoso and composer. Dessoir, Ludwig (1810-74), actor at Berlin. Detmold or Detmond, John (1807-56), German statesman. Disraeli, Benjamin (Lord Beaconsfield) (1804-81), British statesman and writer. Dittel, Leopold, Ritter von (1815-98) Austrian surgeon. Drach, David Paul (1791-1865), librarian of the Propaganda in Rome. Eberti, Georg (1812-84), professor of jurisprudence, Breslau. Edersheim, (1825-89), English theologian and writer. Ewald, F. C. (d. 1874), German divine. Feinberg, Oscar (1844), artist of Mitau, Courland. Felix, Rachel (1820-58), French actress. Fould, Achille (1800-67), French minister of finance. Fraknoi, Wilhelm (1843), Hungarian bishop; president of Hungarian Academy of Science. Friedberg, Emil Albert von (1837), German professor. Friedberg, Heinrich von (1813-95), Prussian minister of justice. Friedenthal, Rudolf (1827-90), German deputy. Friedlander, Ludwig (1824), German professor of archeology. Friedlander, Ludwig Herman (1790-1851), German professor. Friedlander, Max (1829-72), German-Austrian journalist. Gans, Eduard (1798-1839), professor of jurisprudence, Berlin. Goldschmidt, Hermann (1802-66), German astronomer. Güterbock, Karl Eduard (1830), German professor. Hahn, Elkan Markus (1781-1860), professor of philology. Heine, Heinrich (1799-1856), German poet. Henle, Friedrich Gustav Jacob (1809-85), German anatomist, Göttingen. Henschel, A. U., professor of botany (1824-37), Breslau. Herz, Henrietta (1764-1803), German authoress. Hiller, Ferdinand von (1811-86), German musical composer. Hirsch, Siegfried (1816-60), professor of history, Halle. Hirsch, Theodor (1806-81), professor of history, Greifswald. Jacobi, K. G. (1804-57), professor of mathematics, Berlin. Jacobsohn, Heinrich (1826-90), professor of medicine, Berlin. Jacobsohn, Ludwig (1766-1842), professor of medicine, Königsberg. Jacoby, Heinrich Otto (1815-64), professor of Greek, Königsberg. Jaffe, Philip (1819-70), professor of history, Berlin. Joachimstadt, Ferdinand (1816-61), professor of mathematics. Josephsohn, Jacob (b. 1818), Swedish musical composer. Kalisch, David (1820-72), German dramatist. Kalkar, Christian (1803-86), Swedish writer and divine. Klein, J. L. (1810-76), German litterateur. Kronecker, L. (1823), German mathematician. Lebert, Hermann (1813-78), professor of medicine, Breslau. Lehrs, Karl (1802-78), professor of Greek. Lessmann, Daniel (1794-1831), German writer. Levin, Rahel, German social leader. Lewald, Fanny (1811-89), German authoress. Lopez, Sir Menasseh (1831), English judge; M.P. Magnus, Eduard (1799-1872), professor of arts, Berlin. Magnus, Heinrich Gustav (1802-70), professor of chemistry. Magnus, Ludwig Immanuel, mathematician, Berlin. Margoliouth, Moses (1818-81), Jewish historian. Marx, Karl (1818-83), German socialist. Mayer, Solomon (1797-1862), German professor of law. Meier, Moritz Her. Ed., professor of philosophy, Halle. Mendelssohn, Dorothea (1769-1839), German social leader. Mendelssohn-Bartholdy, Felix (1809-47), German composer. Monteflore, Lydia (baptized 1858), aunt of Sir Moses Monteflore. Neander, Johann August Wilhelm (1789-1850), professor of ecclesiastical history, Berlin. Neumann, Karl Fred. (1793-1870), German Orientalist. Palgrave, Sir Francis Cohen (1788-1861), historian. Philippi, Fr. Ad. (1809-82), professor of theology, Dorpat. Ponte, Lorenzo da (1749-1839), writer and composer. Ricardo, David (1772-1823), political economist. Rosenhaim, Johann Georg (1816-87), professor of mathematics. Rubino, Joseph Karl (b. 1799), professor of history, Marburg. Rubinstein, Anton G. (1829-89), Russian musician. Samuda, Joseph d'Aguilar (1813-85), English shipbuilder and Member of Parliament. Simson, Martin Eduard von (1810), lawyer; president of German Parliament; leader of the conservative party. Spiegelberg, Otto (1830-81), professor of medicine, Breslau. Stahl, Fried, (1802-61), professor of jurisprudence. Strousberg, Bethels Henry (1823-84), German financier. Wolfers, Jacob Philip (1803), professor of astronomy. Wolff, Oscar Ludwig (1799-1851), German professor of literature. Ximenes, Sir Moses (1762), English high sheriff.